John 16:13 – However, when He, the Spirit of truth, has come, He will guide you into all truth; for He will not speak on His own authority, but whatever He hears He will speak; and He will tell you things to come. The increase of noise in our lives does not diminish the need for truth in our lives. So what do we do? You find a time and place where you have a God-only-moment, read His Word, have a conversation with Him and when you leave your God-only space, do what our text says the Spirit of Truth does, “whatsoever He hears, He will speak.” Say what you hear! 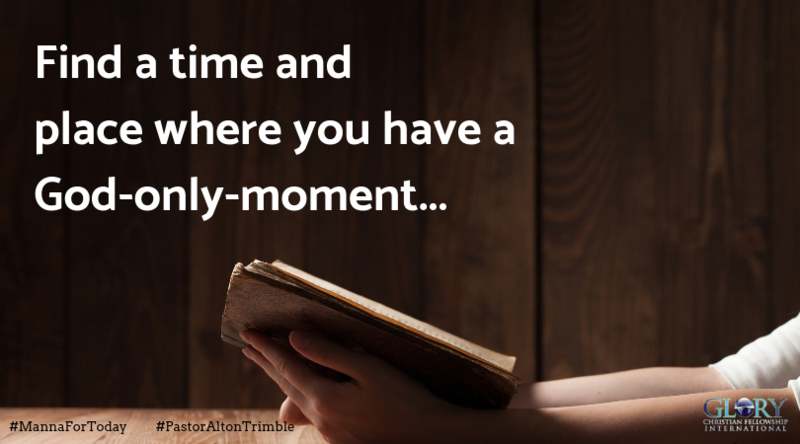 Thank you, Father for giving me a desire to have my quiet place and time with You. Forgive me for the times I jumped into busyness, first. Thank You for conviction and getting me back on track before I go too far. You are my strength, hope and peace. In the name of Jesus, Amen. Teach me Lord to quiet myself so I can hear only you. Perfect Manna for the new year. I will make more time this year to fill my life with the Word, and practice speaking the Word to every situation. thank you Lord for giving the time and space to spend with you every day. I will begin to speak your truth/word daily in my life to everyone I interact with. Thank You Lord for another great Manna for today. Lord make me make You a priority. Lord continue to let me make You the first in everything I do. Thank You Holy Spirit for living me and being accessible to me at all times! Lord when You speak I listen! In Jesus mighty and matchless name, Amen!